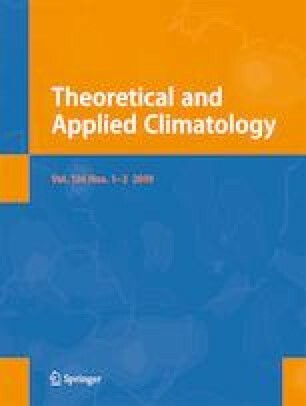 The purpose of this research is to investigate near surface mesoscale equivalent temperatures (TE) in Kentucky (located in east central USA) and potential land cover influences. TE is a measure of the moist enthalpy composed of the dry bulb temperature, T, and absolute humidity. Kentucky presents a unique opportunity to perform a study of this kind because of the observational infrastructure provided by the Kentucky Mesonet (www.kymesonet.org). This network maintains 69 research-grade, in-situ weather and climate observing stations across the Commonwealth. Equivalent temperatures were calculated utilizing high-quality observations from 33 of these stations. In addition, the Kentucky Mesonet offers higher spatial and temporal resolution than previous research on this topic. As expected, the differences (TE − T) were greatest in the summer (smallest in the winter), with an average of 35 °C (5 °C). In general, the differences were found to be the largest in the western climate division. This is attributed to agricultural land use and poorly drained land. These differences are smaller during periods of drought, signifying less influence of moisture. This research is funded by the WKU Graduate Student Research Fellowship. The authors would like to thank Dr. Eric Rappin, William Rodgers, and Dolly Na-Yemeh for technical assistance.